Enjoy Mystery savings from Jockey. Reveal your deal at checkout. 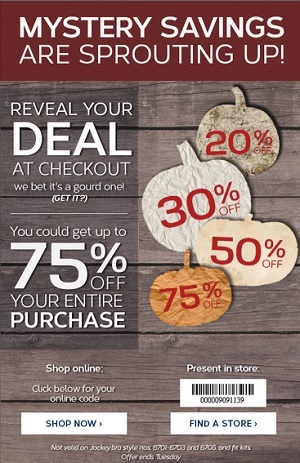 You could get up to 75% off your entire purchase. Offer is valid at Jockey stores in the U.S. and online. Coupon must be printed to receive the offer. Offer ends 10/13/2015. More details available at stores or online.